I hope all of you are staying bundled up, warm, and getting to spend some time in the workshop. For me, February is sort of like the “hump” month of winter. Still cold, but the days are getting a little longer and we’re beginning to see more sunshine. With a little luck, you might even catch a day or two where you can get outside and wiggle the sticks. A nicely stocked hobby shop in UAE. Backing up a bit: At the beginning of November, I traveled to the AMA West Expo in Pomona, California. The new venue, located at Fairplex, formerly known as the Los Angeles County Fairgrounds, is very spacious and also allows for some outdoor flying. 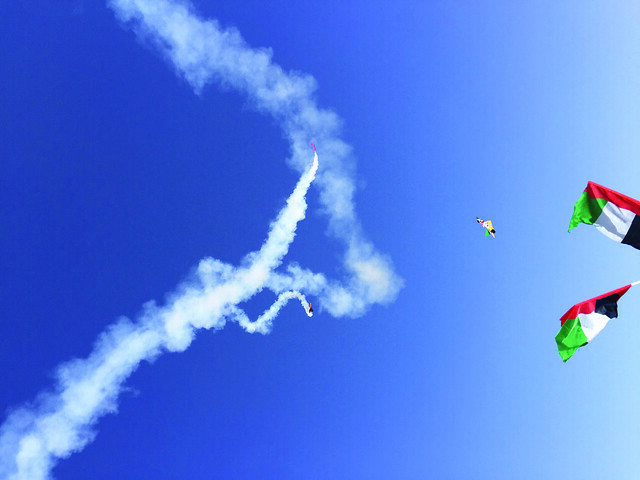 District VII members Jase Dussia and Ashleigh Heath entertained us with fantastic flying demos all weekend. If you find yourself visiting Southern California next fall, try to plan to stop by. Now please don’t take this as me trying to rub snow in your face, but I also traveled with my son, Andrew, on a business trip to Dubai and Abu Dhabi in the United Arab Emirates (UAE). We were invited there to attend several fly-ins that were going on in connection with the country’s Founders Day celebrations. We were joined by modelers from Germany, Spain, and India, just to name a few. To say that I was blown away by the people and the flying sites would be an understatement. The warm welcome and hospitality we were shown was second to none. Of the many things that we found interesting was that the UAE is extremely supportive of unmanned aviation. Not only was the flying facility built and maintained by the government, there was also an unmanned flight school and another school that taught aerial cinematography. Another thing that caught my attention was that there were five full-service hobby shops located on the campus, stocked with radios, engines, and a full assortment of kits from stick-built to Giant Scale ARFs. I might add that all of them appear to be thriving. This experience reaffirmed my belief that we as aeromodelers share a connection and camaraderie that spans across any borders that are crossed.